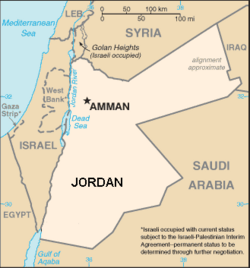 Location of Amman within Jordan. Amman, sometimes spelled Ammann (Arabic عمان ʿAmmān), is the capital, largest city, and economic center of the Hashemite Kingdom of Jordan. The city, which has served as both the modern and ancient capital, has a population of nearly 1.04 million, with 2.13 million in the metropolitan area known as Greater Amman. Due to the city’s modern-day prosperity and temperate climate, almost half of Jordan’s population is concentrated in the Amman area. Amman is a city of contrasts, a unique blend of old and new; its modern buildings blend with the remnants of ancient civilizations. It is believed to be one of the oldest continuously inhabited cities in the world. 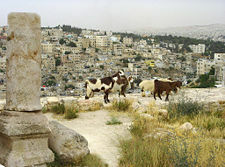 Numerous Biblical references are made to Amman, the Ammonite capital of Rabbath-Ammon. The city was originally built on seven hills, but it now spans over an area of 19 hills. Its downtown area sits at the bottom of four of its original seven hills, and is the location of most of the city's noteworthy sites. These include the remains of the ancient citadel, the adjoining archaeological museum, and a large, finely preserved Roman amphitheatre, which once seated 6,000. There are additional numerous sites of interest, Biblical, historical, or geological, which are in close proximity to Amman. The people of Amman are multi-cultural, multi-denominational, well educated and extremely hospitable. The city is the seat of one of the most politically liberal and advanced of the Arab nations, whose leaders have continually been committed to the peace process. The name traces back to “Ammon,” the capital of the Ammonites, a Semitic people spoken of in the Bible. Amman is located in a hilly area of northwestern Jordan. The city was originally built on seven hills, but it now spans over an area of 19 hills (each known as a jabal or "mountain"). The main areas of Amman gain their names from the hills and mountains on whose slopes they lie. Many of the hills are higher than 2,625 feet (800 meters). Because of the cooling effects of its location on a triangular plateau, Amman enjoys four seasons of excellent weather as compared to other places in the region. Summer temperatures range from 82°F (28°C) to 95°F (35°C), but with very low humidity and frequent breezes. Spring and fall temperatures are extremely pleasant and mild. The winter sees nighttime temperatures frequently near 32°F (0°C), and snow is known in Amman. Total annual rainfall is 10.1 inches (258.3mm). It typically will not rain from June to the beginning of September, with cloudy and blue skies prevailing. The course of the seasonal river of Wadi Amman and tributaries run through Amman. The land area of the city is approximately 270 square miles (700 square kilometers). Amman has both a modern and historic touch. Old Amman is filled with souks, or bazaars, small shops, and single family dwellings all crowded together. West Amman, however, is less crowded and more scenic. Parks and wide boulevards with towering apartments and office buildings dominate the scene. Most of the city's five-star and four-star hotels are located in this area. Villas and expensive apartment complexes are common. Shmeisani, the main economic center of Amman, and Abdoun, the up-scale residential district, are the two main areas of "West Amman," much different from the overly crowded Jabal al-Qalat in Old Amman. Shmeisani and Abdali are the two main financial districts. Amman seen from Citadel hill. Archaeological discoveries in 'Ain Ghazal, in eastern Amman, showed evidence of Neolithic settlement and artistic work, dating to around 8500 B.C.E. The earliest remains of fortified settlements belong to the Chalcolithic Age (c. 4000 to 3000 B.C.E.). In the thirteenth century B.C.E., the city was called Rabbath Ammon by the Ammonites. The “royal city” which King David's general Joab (II Samuel 12:26) took, was probably the acropolis on top of the plateau. King David (1037-967 B.C.E.) sent Uriah the Hittite to his death in battle outside city so that he might marry his wife, Bathsheba (II Samuel 11). David's son Solomon had Ammonite wives, one of whom became the mother of Rehoboam, Solomon's successor. The city was conquered by the Assyrians, followed by the Persians. Alexander the Great conquered the region in 332 B.C.E. Ptolemy II Philadelphus, the Hellenic ruler of Egypt, rebuilt the city and renamed it Philadelphia. The Seleucids conquered the city in 218 B.C.E., beginning a period of turmoil. The city became part of the ancient Arab, Semitic, trading kingdom, the Nabataean, until 63 C.E., when Philadelphia came under Roman control and joined the Decapolis. In 106 C.E. it was included in the Roman province of Arabia and rebuilt. In 326 C.E., Christianity became the religion of the empire and Philadelphia became the seat of a bishopric during the beginning of the Byzantine era. One of the churches of this period can be seen on the city's Citadel. 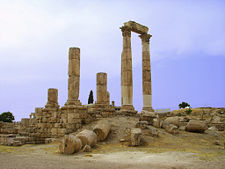 Philadelphia was renamed Amman during control of the Ghassanians, a group of South Arabian Christian tribes who migrated from Yemen around 250 C.E. With the rise of Islam, Arab general Yazid ibn Abi Sufy took Amman in 635 C.E. The city flourished under the Caliphates (with nearby capital) of the Umayyads (in Damascus) and the Abbasids (in Baghdad). Earthquakes destroyed the city, which by 1300 appeared to have become almost deserted. It remained a small village and a pile of ruins until 1878, when the Ottoman Turks brought in Circassian refugees from Russia. The tide changed when the Ottoman Sultan decided to build the Hejaz railway, linking Damascus and Medina, facilitating both the annual hajj pilgrimage and permanent trade, putting Amman, a major station, back on the commercial map. After World War I (1914-1918), Transjordan became part of the Palestine Mandate. In 1921, Britain established a protected emirate of Transjordan, ruled by Abdullah I. In 1921, Abdullah I chose Amman as seat of government for his newly-created state, and later as the capital of the Hashemite Kingdom of Jordan. As there was no palatial building, he started his reign from the railway station, with his office in a train car. Amman remained a small city until 1948, when the population expanded considerably due to an influx of Palestinian refugees from what became Israel after the first Arab-Israeli war in 1948–1949. Amman has developed rapidly since 1952 under the leadership of two Hashemite Kings, Hussein I of Jordan and Abdullah II of Jordan. After the Six-Day War of 1967, when Jordan lost all territory west of the Jordan River to Israel, a second and larger wave of refugees arrived. In 1970, Amman was the site of clashes between the Palestine Liberation Organization (PLO) and the Jordanian army. Everything around the Royal Palace sustained heavy damage from shelling. Most of Amman suffered great damage from PLO rockets and the Jordanian army's shells. A third wave of Palestinian and Jordanian and Southeast Asian refugees - working as domestic workers - arrived in Amman from Kuwait after the Gulf War of 1991. The first wave of Iraqi refugees settled in the city after the first Gulf War, with a second wave also arriving after the 2003 invasion of Iraq. New construction within the city increased dramatically with new districts of the city being founded, particularly in West Amman, following this flood of refugees. On November 9, 2005, coordinated explosions rocked three hotels in Amman. The Islamist organization, al-Qaeda, claimed responsibility, and Jordanian terrorist leader, Abu Musab al-Zarqawi, who has since been killed, was also believed responsible. A lone gunman attacked Western tourists during a guided trip to the downtown Roman Theatre in September 2006, shooting five of them, one fatally. The man was immediately caught, and claimed to have acted in response to the fighting between Israel and Lebanon during the prior months. Administratively, Jordan is divided into 12 governorates, each headed by a governor appointed by the king. They are the sole authorities for all government departments and development projects in their respective areas. The governorates are subdivided into approximately 52 subdistricts. The governorates are: Ajlun, Amman, Aqaba, Balqa, Irbid, Jerash, Kerak, Ma'an, Madaba, Mafraq, Tafilah, Zarqa. The Amman Governorate, officially known as Muhafazat al-Asima (Arabic محافظة العاصمة, English translation: The Capital Governorate), is further divided into 20 regions. 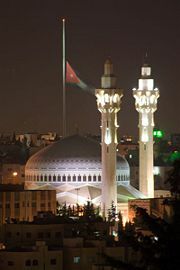 Amman City is the governorate's capital city, and serves as Jordan's national capital as well. 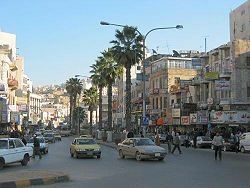 The old downtown section of Amman. Amman is a regional hub, and is Jordan's chief commercial, financial, and international trade center. A construction boom has brought massive economic growth. Projects include: The Abdali Downtown project, which consists of stores, malls, restaurants, residential and office buildings, a new library and performing arts center, landscaping, man made canals and water fountains; Bonyan city, which consists of five new skyscrapers for apartments and offices; the Jordan Gate Towers, which are two identical skyscrapers to house offices; Amman Financial Tower, consisting of 56 floors; the Limitless Towers, which are two identical 65 floor buildings connected by a pedestrian walkway that will house the world's highest swimming pool; the Andalucian Village, which includes over 600 villas, and consists of spas, fitness and health centers, swimming pools, and a recreation area; and a massive new Royal Jordanian headquarters. Phosphate extraction and petroleum refining are the most significant industries. Other important industries include food and tobacco processing, manufacture of textiles, paper, plastics and metal products. Its airport, Queen Alia International Airport, is the hub of the national carrier, Royal Jordanian, which is a major airline in the region. The airport has three terminals, two passenger and one cargo, and in 2007 handled between 4 to 5 million passengers. The Hejaz railway, built in the early 20th century, was used primarily for pilgrims to reach the holy cities of Mecca and Medina, but now the rail line is basically used by tourists. Amman has an extensive highway system that links every part of the city to one another. Its highways also link nearby cities such as Zarqa and Madaba. The population was 2,125,400 in 2005. Arabs make up 98 percent of the population, Circassians make up one percent, and Chechens, Armenians, and Kurds make up the remaining one percent. The official language is Arabic. English is used widely in commerce and government and among educated people. Arabic and English must be taught at public and private schools, while French may be taught at some schools but is not obligatory. 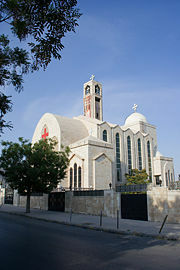 Amman is home to many diverse religious sects making up the two primary religions of Jordan, Islam and Christianity. Numerous mosques and churches dot the capital. The most famous mosque in Amman is the King Abduallah I Mosque which can house nearly 3,000 people. Amman is the location of the University of Jordan, founded in 1962, and several museums and libraries, including the National Library. The unique geological rock formations of Wadi Rum. The colorful rocks are best viewed at sunset and are located a half hour away from Petra. Wadi Rum has connections with T. E. Lawrence; consequently the movie Lawrence of Arabia filmed a number of scenes there. The Citadel hill of Amman, known as Jabal el Qala, which has been inhabited for centuries, and which is important as a military and religious site. Remains unearthed at the northern and eastern ends of the Citadel possibly date back to the Bronze Age. The Citadel is home to the Temple of Hercules which is said to have been constructed under the Roman Emperor Marcus Aurelius who reigned from 161-180 C.E., and is similar to the Temple of Artemis in Ephesus. Behind the Roman forum stands a Roman theatre—the largest theatre in Jordan—with room for 6000 spectators. Thought to have been built between 138 and 161 C.E. by the Roman Emperor Antoninus Pius, it is constructed into the side of the mountain and is still used for sports displays and cultural events. Amman is also home to some of the grandest mosques in the Middle East, although they compare less favorably to the ones to be found in Istanbul, Turkey. The newest of these is the enormous King Abdullah I Mosque, built between 1982 and 1989. It is capped by a magnificent blue mosaic dome beneath which 3000 Muslims may offer prayer. The most unusual mosque in Amman is the Abu Darweesh Mosque atop Jabal Ashrafieh, the highest point in the city. It is covered with an extraordinary black and white checkered pattern and is unique to Jordan. ↑ Department of Statistics- Jordan. Dos.gov.jo. Retrieved December 9, 2011. ↑ Amman population in 2011. True Knowledge. Retrieved March 5, 2012. Encyclopaedia Britannica. Amman Retrieved June 25, 2008. LookLex Encyclopaedia. Amman. Retrieved June 25, 2008. This page was last modified on 25 March 2019, at 04:26.